Are you ready for another amazing release? We are only five days away from the big day! All the new Stamps and Die-namics will be available on Tuesday, December 5 at 9:00 pm EDT. Be sure to check out the MFT Blog to see all the new items being revealed today. Don't forget to leave a comment on the MFT Blog countdown posts, YOU could win one of the five $75.00 gift vouchers. I have a fun card to share with you today. It features the adorable new Town Bear stamp set, the Open Road Die-namics, and the Stitched Tag-Corner Square STAX Die-namics. I stamped the images on X-Press It card stock and coloured them with Copics. The road and grass were also die-cut in X-Press It card stock and were coloured with Copics. 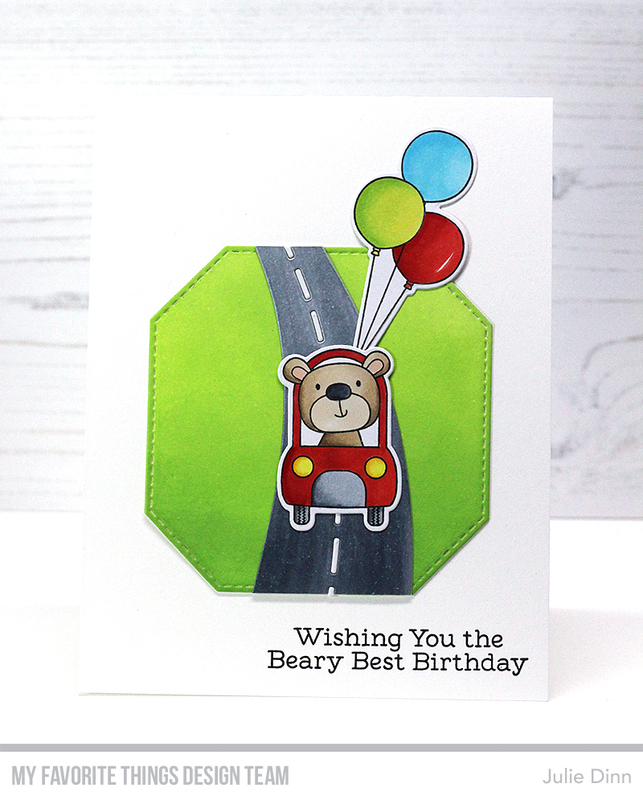 Such a cute birthday card using this wonderful Town Bear set, the road, the shape die, etc. Can’t wait to get these sets. Thanks. Cute card, great Bear set! This is such a fun and cute card ! Darling card design and so cute.